World Weaver Press, 9780692661826, 160pp. Fire is never tame-least of all the flames of our own kindling. Raised in isolation by the secretive Circle of Seven, Luna is one of the few powerful beings left in a world dominated by man. Versed in ancient fairy tales and the language of plants, Luna struggles to control her powers over fire. When Luna's mentor dies in her arms, she is forced into a centuries-long struggle against the gravest enemy of all Fae-kind-the very enemy that left her orphaned. In order to save her people, Luna must rewrite their history by entering a door in the mountain and passing back through time. But when the lives of those she loves come under threat, her rage destroys a forest, and everything in it. Now called the Char Witch, she is cursed to live alone, her name and the name of her people forgotten. Until she hears a knock upon her long-sealed door. 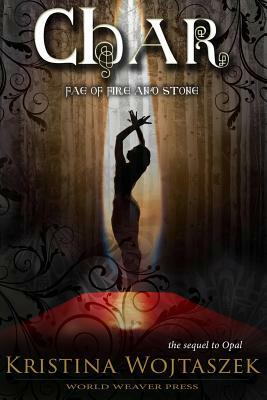 Interwoven with elements of Hansel and Gretel and The Seven Ravens, Char is the stand alone sequel to Opal, and second in the Fae of Fire and Stone trilogy. Kristina Wojtaszek grew up as a woodland sprite and mermaid, playing around the shores of Lake Michigan. At any given time she could be found with live snakes tangled in her hair and worn out shoes filled with sand. She earned a bachelor's degree in Wildlife Management as an excuse to spend her days lost in the woods with a book in hand. Now a mother of two little tricksters and their menagerie of small beasts, she continues to conjure bits of fantasy during the rare spell of silence. Her fairy tales, ghost stories, poems and YA fiction have been published by World Weaver Press, Far Off Places and Sucker Literary Magazine. Follow her @KristinaWojtasz or on her blog, Twice Upon a Time.